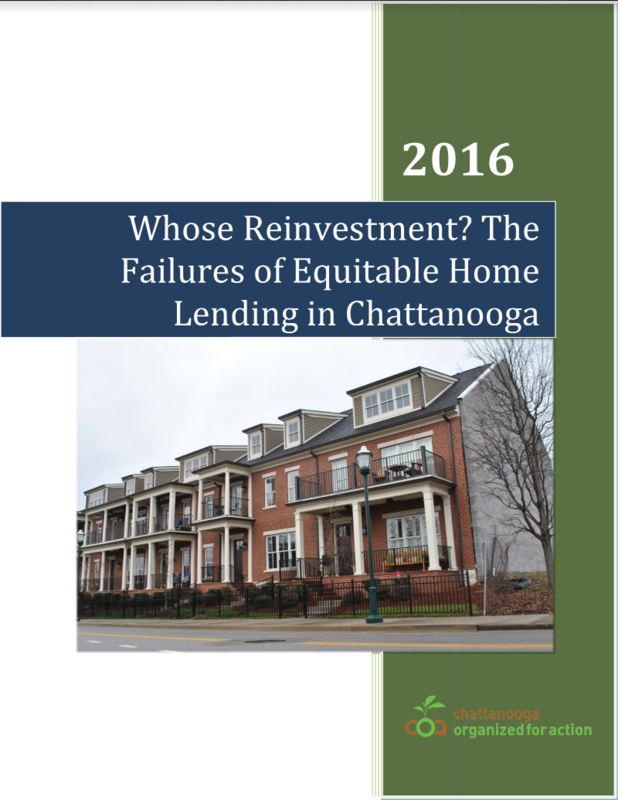 COA's report on major discriminatory lending practices, entitled Whose Reinvestment: The Failure of Equitable Home Lending in Chattanooga, has been released after nearly a year of work. The report may be read HERE. ● Race matters in the Chattanooga lending market. Mortgage lending is substantially greater in neighborhoods that are predominately white, and African-American neighborhoods are lending deserts. Even when homes loans are given in predominately black census tracts, few loans are being awarded to African-Americans. ● Large, particular largely minority, sections of Hamilton County have been disinvested by major lenders. There is notable lack of investment in high minority census tracts, especially much of East Chattanooga and Alton Park, as well as disinvestment in the rural parts of Hamilton County in the northeast and northwest corners. ● There is a significant disparity in home loan origination between African-American and white residents of Chattanooga. The disparity ratio of approved loans to relative percentage of population was 36% for African-Americans and 107% of whites.
. ● The lending market seems to favor other minorities over African-American minorities. In terms of both disparity ratio as well as the total number of loans originated relative to population sizes, other minorities fare better than African-Americans in the lending market. While white populations have the best advantage at securing a loan, non-black minorities have significantly greater loan rates than the city’s black population for nearly every bank. ● Banking branches are not easily accessible in high-minority and/or low-income census tracts in Chattanooga. As a metric of community investment, banking branches are often not present in the communities in most dire need of lending.